An animation classic! This definitely qualifies as a movie I’ve been meaning to see, so it’s thrown in among the 500. 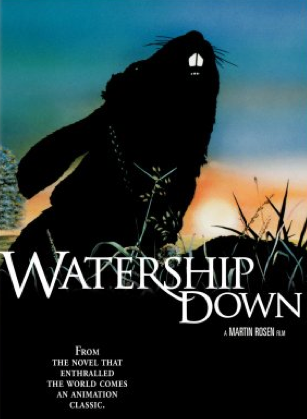 Watership Down also has two details that interested me even more: It continually makes lists of the most violent cartoon movies ever made, and it stars a very young War Doctor. It also had music by Art Garfunkel, which is just delightful. The gist: The movie begins in a legend, on the origin of rabbits. Every rabbit believes it, and sees it as the origin of their species. The first rabbit to ever exist had too many children, and refused to control his fellow rabbits even if it was best for every animal to do so. God retaliated, and gave most animals the desire to eat the flesh of rabbits. With their numbers reduced, the first rabbit learned his lesson about the power of God. And so God gave the rabbits two gifts of their own: Speed and intelligence. With these two gifts, all rabbits now know their place in the world. Flash forward to the present. Among a family group of rabbits, there’s one tiny rabbit named Fiver. He has a vision of a horrible event that’s about to happen that will wipe out the entire group. A select few rabbits believe him, and they run away to start a new group somewhere else. They look for the perfect place far and wide, encountering predators, traps, and tyrannical rabbits who clearly aren’t as aware of their place in the world as the first rabbit from their legends. What I “learned”: Violence really isn’t that big of a deal. At least not in nature. Seriously, it isn’t. I know this movie’s been labeled as a super-violent movie, and I had braced myself for that experience. But in truth, this movie’s just accurate to how the life of a rabbit probably goes. People die at random. Predators are everywhere. That’s life. You have to pick up and move on. See this movie if you like: Animals in movies that don’t act like humans. Sure, these animals are sentient and have feelings. But they aren’t the naysaying parents from movies like Ratatouille, chiding their offspring for wanting to be anything but rabbits. In this world, any rabbit that doesn’t act like a rabbit will die. That’s the world. It’s a lot easier to sink into than most of the 3D nonsense we see today. Now, where’s my cane? Avoid this movie if: You think Animal Farm is the greatest story ever told. Not to say that that book (and movie) aren’t fantastic, because they are. They’re classics for a reason. But you have to abandon all hope of a super-duper sensible plot here. These rabbits are looking for a home, and by the time they get there they realized they messed up. So they continue on. It’s so much less political, and more… spiritual? Not sure if that’s the right word for it. But the rabbits believe in a rabbit god, and believe strongly in their place in the grand order of things. That faith permeates the movie, and may offend the more cynical of our animation fans.